Very Good. 1439156735 ALL BOOKS SHIPPED WITHIN 1 DAY OF PURCHASE! Poor. Light shelf wear to extremities, creases along spine and in covers. Tanning and foxing, predominantly to page edges. Previous owner name on first page. A-format paperback. 956 p.
Good. Some shelf wear, some outer edges have light scuffs, otherwise book content is in very good condition. 956 p.
Good. Swan Song by McCammon, Robert, 1988-02-01. A-format paperback. 956 p.
Read this book in the mid 90's. When I read the synopsis, it wasn't my typical book type. Oh my god, I couldn't put it down once I started reading it. To this day its one my favorite books EVER!!!! A MUST read!!! This has to be one of the best books I have ever read and I have read many. I can honestly say I have read this book more than a dozen times and have had about ten copies of it. I would loan one out and have to reorder because they were not returned or someone lost the book. I have brought many people to Swan Song and hope to keep bringing people to this wonderfully written and inspiring book. only half way done as of now, but very compelling story. it's difficult to put down. 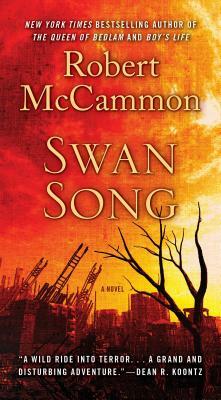 Swan Song" is Mr. McCammon's seminal book. I have read it about 12 or 14 times so far since I first got the paperback book as a gift back in '87 from a lady friend of mine. I would recommend it to anyone who likes an extremely well written book. This is one of my all-time favorite books by macmanamon. But this copy I sent to my son because he has an old dog-eared version. He loved it! !